When the works commence, tram routes will be diverted to run via Kallio and Sturenkatu and there will be no tram services in Sörnäinen for the duration of the works. 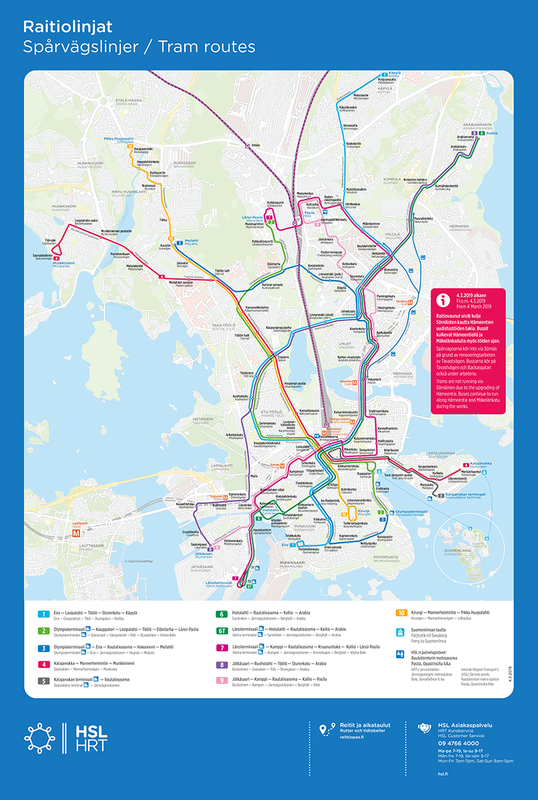 The change affects tram routes 1, 6, 6T, 7 and 8. Buses will continue to run along Hämeentie throughout the works but there will be changes to stop locations as the works progress. In addition, the ticket hall roof at Sörnäinen Metro Station will be replaced and some of the station entrances will be closed. However, the station will remain open throughout the works and the metro will run as usual. Information about changes to station entrances and stop locations will be provided as soon as it will be available. Changes to public transport will be implemented in two phases. The first phase will start on 4 March 2019 and is expected to last until early 2020. The second phase will take place in 2020, when tram services will return to Sörnäinen. Trams 1 and 8 will resume their normal routes but trams 6, 6T and 7 will continue to run between Hakaniemi and Sörnäinen via Kallio. You can find out more about the effect of the works on your public transport journeys in the Journer Planner. Enter a search date after 4 March 2019. More information is available (in Finnish) on the City of Helsinki website: hel.fi/uusihämeentie. The text continues below the map. Click on the map (PDF) to enlarge it. From 4 March 2019, tram 1 will run between Urheilutalo and Hattulantie via Sturenkatu. The tram will serve the “Urheilutalo” and “Roineentie” stops along the diversion route. Trams 6 and 6T will run between Hakaniemi and St. Paul’s Church via Kallio and Sturenkatu. The tram will serve the “Hakaniemi” (platforms 1 and 2), “Kallion virastotalo”, “Karhupuisto”, “Kaarlenkatu”, “Urheilutalo” and “Roineentie” stops along the diversion route. Tram 7 will run between Hakaniemi and Hattulantie via Kallio and Sturenkatu. The tram will serve the “Hakaniemi” (platforms 1 and 2), “Kallion virastotalo”, “Karhupuisto”, “Kaarlenkatu”, “Urheilutalo” and “Roineentie” stops along the diversion route. Tram 8 will run between Urheilutalo and St. Paul’s Church via Sturenkatu. The tram will serve the “Urheilutalo” (on Läntinen Brahenkatu) and “Roineentie” stops along the diversion route. 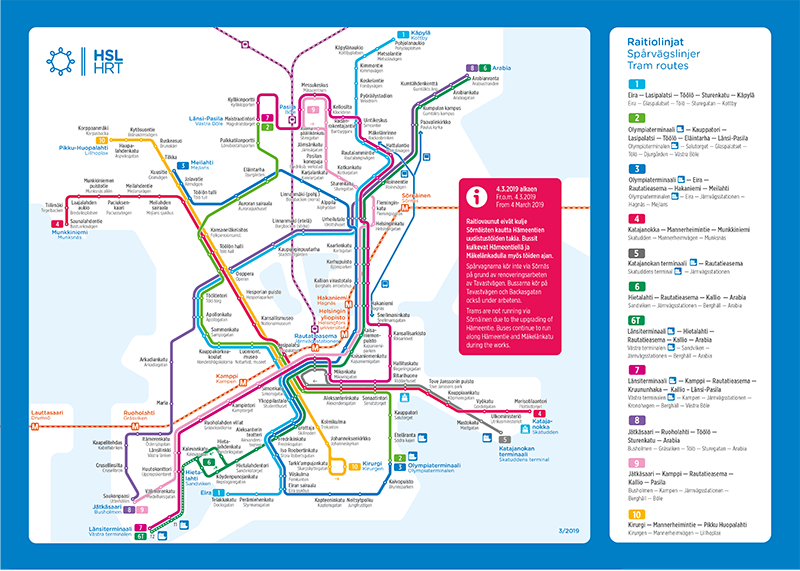 There will also be changes to tram stops in Hakaniemi and by Urheilutalo. In Hakaniemi, platforms 3 and 4 (from/in the direction of Hämeentie) will be closed and all trams will use platforms 1 and 2. Trams 3 and 9 already use these platforms. A new temporary stop is constructed on Helsinginkatu by Urheilutalo. The stop is located at the junction of Helsinginkatu and Läntinen Brahenkatu and it will be served by trams running from Urheilutalo towards Hakaniemi. All trams running via Urheilutalo will serve only one stop by Urheilutalo. The stops for each route are located close to the junction of Helsinginkatu and Läntinen Brahenkatu in the direction of travel. 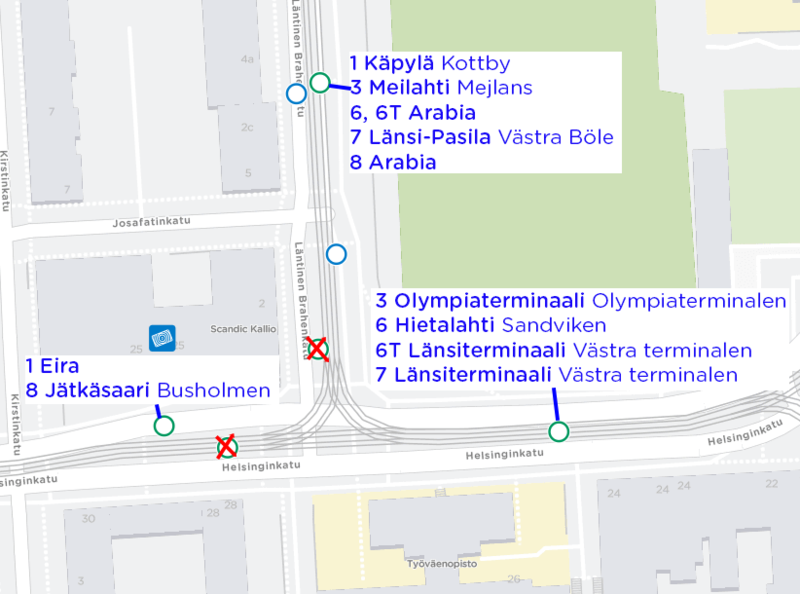 Trams 1, 6, 6t, 7 and 8 to Mäkelänkatu and Arabiaa will depart from the same “Urheilutalo” stop on Läntinen Brahenkatu as tram 3 (stop H0259, stop in the Journey Planner). At the same time, the current “Urheilutalo” stop on Helsinginkatu served by trams 1 and 8 in the direction of Sörnäinen will be withdrawn. 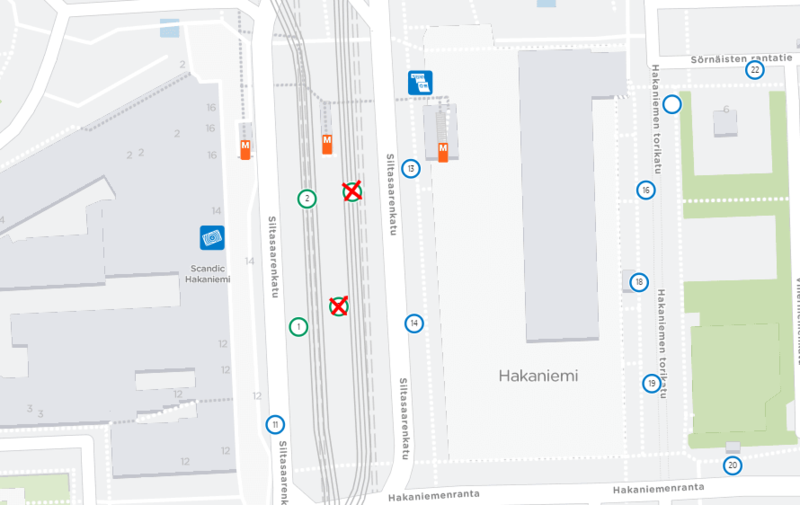 Trams 3, 6, 6t and 7 to Hakaniemi will depart from the new, temporary stop on Helsinginkatu (H0287, stop in the Journey Planner). At the same time, the current “Urheilutalo” stop served by tram 3 in the direction of Hakaniemi (H0260) will be withdrawn. Trams 1 and 8 in the direction of Opera House will depart from the same stop as at present. Buses will continue to run along Hämeentie and Mäkelänkatu as usual throughout the works. However, there may be changes to stop locations as the works progress. The Sörnäinen Metro Station will remain open but some of the station entrances will be closed as the works progress. The tram diversions will cause changes to the stops of bus 51: the bus will not serve the “Porvoonkatu” stop (in the direction of Malminkartano) on Brahenkatu to ensure effective operation of tram services. Instead, the bus will serve the “Sturenkatu” stop at the junction of Aleksis Kivenkatu on Sturenkatu (in the direction of Vallila).